In September of 2006, in Lewisburg, Tennessee, a neighborhood group protested because the public library was investing resources in the purchase of books in Spanish. Of the sixty thousand volumes, only one thousand were published in a language other than English. The annual budget, totalling thirteen thousand dollars, dedicates the sum of one hundred and thirty dollars to the purchase of books in Spanish. The buying spree representing one percent of the budget enraged some of the citizens of Tennessee, causing them to take the issue to the authorities, arguing that a public service, sustained through taxes charged to the U.S. populace, should not promote something that might benefit illegal workers. Thus, the new conception of culture surpasses that distant precept of the ancient library of Alexandria. That now almost completely forgotten library achieved the height of its development in second century Egypt. Its backward administrators had the custom of periodically sending investigators throughout the world in order to acquire copies of texts from the most distant cultures. Among its volumes there were copies of Greek, Persian, Indian, Hebrew and African texts. Almost all of those decades-long efforts were abruptly brought to an end, thanks to a fire caused by the enlightene ships of the emperor Julius Caesar. 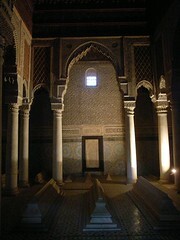 Nearly a thousand years later, another deliberately-set fire destroyed the similarly celebrated library of Córdoba, founded by the caliph Al-Hakam (creator of the University and of free education), where the passion for knowledge brought together Jews, Christians and Arabs with texts from the most diverse cultures known in the period. Also in this period, the Spanish caliphs were in the habit of dispatching seekers throughout the world in order to expand the library’s collection of foreign books. This library was also destroyed by a fanatic, al-Mansur, in the name of Islam, according to his own interpretation of the common good and superior morality. The Tennessee anecdote represents a minority in a vast and heterogeneous country. But it remains significant and concerning, like a sneeze on a passenger train. Also significant is the idea, assumed there, that the Spanish language is a foreign language, when any half-way educated person knows that before English it was Spanish that was spoken in what today is the United States; that Spanish has been there, in many states of the Union for more than four hundred years; that Spanish and Latino culture are neither foreign nor an insignificant minority: more than forty million “Hispanics” live in the United States and the number of Spanish-speakers in the country is roughly equivalent to the number of Spanish speakers living in Spain. If those who become nervous because of the presence of that “new culture” had the slightest historical awareness, they would neither be nervous nor consider their neighbors to be dangerous foreigners. The only thing that historically has always been dangerous is ignorance, which is why the promotion of ignorance can hardly be considered synonymous with security and progress – even by association, as with the reigning method of propaganda, which consists of associating cars with women, tomatoes with civil rights, the victory of force with proof of the Truth or a million dollars with Paradise. The University of Georgia, October 2006.